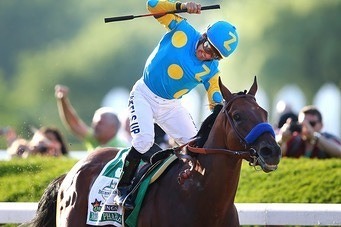 American Pharoah won the first Triple Crown since 1978, but as with the overnight ratings, viewership for the Belmont Stakes was down from last year. The “race portion” coverage from 6:15-7:15 averaged 18.6 million viewers. Down from the 20.6 million last year. But during the quarter hour that included the actual race (6:45-7p ET) peaked with 22 million viewers. Game 2 of the Stanley Cup Final between the Chicago Blackhawks and Tampa Bay Lightning which aired immediately after the Belmont Stakes averaged 6.6 million viewers and was the most-watched game 2 on record and the most-watched non-deciding Stanley Cup Final game on record.